We never thought that anything could destroy his beautiful wickedness, but it turns out that Lou Reed was mortal after all. Lou came into our safe suburban teenage bedrooms singing about sick things we never dreamed of. We were the few who invited him in, because we wanted something real. We were sick of love songs. Lou took us down dark alleys to drug dens and squalid rooms. Lou Reed showed us the wonders of the underworld – the ultimate reality show. His songs were peep shows into secret forbidden places and their inhabitants; hustlers, prostitutes, junkies and transvestites. He taught us all about decadence. Our subterranean sleuth illuminated a time when New York City was gritty, seedy dangerous and genuine. The good old days. He enlightened us to gender bending and hustling. He lived it all himself. An equal opportunity guy, Lou had relationships with men, women and others. An advocate for deviants and the downtrodden, Lou gave a voice to those who were never heard before. He showed us people just like ourselves, but although they were underground, they were in no way beneath us. We could easily become them. Lou recalled how, during live concerts people threw their handkerchiefs at The Beatles and their knickers at Tom Jones, “Whereas with me they threw syringes and joints”. Then in 1972, Lou went solo, writing musical novellas with strange and often sad characters, some fictional and some real. Caroline and Jim, and the narrator of his creepy cabaret, Berlin. Warhol Factory friends Holly, Candy, Joe, Jackie and the Sugar Plum Fairy in the infamous ‘Walk On The Wild Side’. Inspired by the Beat poets, he kept it simple. Few chords and few words that spoke volumes. Almost Haiku. He once said, ‘One chord is fine. Two chords are pushing it. Three chords and you’re into jazz.’ AlthoughLou affected a detached narrative vocal style, he was fully entrenched in his songs, and was truly intimate with the characters. His voice was endearingly vulnerable at times. Ironically, his influences were Bettye LaVette, Doc Pomous, Delmore Schwartz, Edgar Allan Poe, 1950s Doo Wop…somehow it doesn’t come out that way, but Lou did it his way. His life was saved by rock n’ roll. Lou was always in search of the perfect note. He usually reached it on-stage during ‘White Light/White Heat’, ‘Sister Ray’, ‘Waves of Fear’, ‘Kill Your Sons’, ‘Strawman’, ‘The Bells’ and several on Metal Machine Music. His glorious cacophony would break up to reveal that one note – a braying donkey, screeching brakes, a car crash. He would levitate in ecstasy when it came! The veins in his neck would bulge. His audiences sounded like a herd of wounded cows, or as if they were booing, but chants of ‘Looooouuuuuu!! !’ filled every venue he played. Then there were his drones. ‘Junior Dad’ is a tormented and beautiful piece. If you have overlooked the divisive album Lulu (Lou’s collaboration with Metallica released two years before his passing), at least listen to this track. You owe it to Lou to hear him. Hear his essence. Near the end of his life, Lou was still obsessed and longing for his father’s approval and affection although his hatred and loathing prevailed. This is a love song wrapped in a waning feeling of aversion – the crux of his pain – begging for love from somebody who is now gone. Lou can safely ask these questions because his dad is no longer here to answer them. Would you come to me if I was half drowning? An arm above the last wave? Would you come to me? Would you pull me up? Would the effort really hurt you? Is it unfair to ask you, to help pull me up? The vibrations and perfect frequencies created in the 8-minutes long ending of this masterpiece written two years prior to his passing seem to have the meditative healing qualities of Tibetan singing bowls. If you listen and if you care, let the beautifully sustained droning ending of this 19+ minutes long epic take you to a place where all is free and painless. 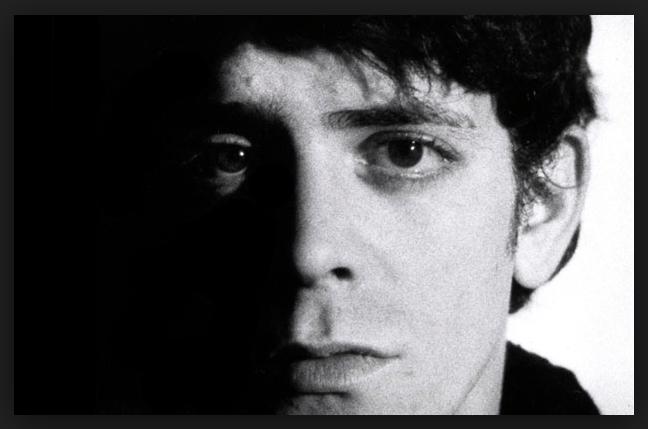 It is extremely saddening that Lou felt that he had become like his dad, or perhaps – hopefully this is just another attribution of the Lou Reed character he created and inhabited for most of his life to escape the pain. In 1979 Lou Reed spoke about what it was like growing up gay in the 1950s/1960s. Some say that Lou was extremely difficult, leading The Onion to publish this hilarious headline upon his transplant, New Liver Complains of Difficulty Working with Lou Reed. The guitar lines in ‘Big Sky’ (Ecstasy, 2000) echo the melody of ‘America the Beautiful, evoking the spacious skies of our national song. Lou scorns the chaos and failures of our leadership along with a message of liberation; Big sky, big enormous place / Big wind blow all over the place / Big storm / wrecking havoc and waste/ But it can’t hold us down anymore. But who was Lou Reed? A crazy cool, sarcastic genius who influenced thousands of lives across several generations. He had a bad rep for a sweet guy. Rock n’ Roll Animal, Accidental Anthropologist, New York Punk, Author, Photographer, Grumpy Old Man, Tai Chi practitioner. His masterpiece is Berlin. His 20th and final solo album was Hudson River Wind Meditations (2007). He was finally at peace. Sha la la la babe – now he just slipped away. I hope he reached the kingdom. The people just have to die for the music. People are dying for everything else, so why not for music? Die for it. Isn’t it pretty? Wouldn’t you die for something pretty?